I grew up on a farm northeast of Brandon and helped my mom with her huge garden by helping her weed the garden, then later picking and preserving all kinds of vegetables and fruits. In the summer of 1981, when I was 19, I worked for 4 months at Patmore Nursery Sales in Brandon, potting and selling all kinds of plants from the annuals to the perennials, to the trees and shrubs. I learned so much that summer! In 1986, married and with a little baby girl, we moved back to the Brandon area. Gardening and plants still really interested me. About 23 years ago, I joined the Brandon Garden Club. About 14 years ago, BJ Jackson was the special speaker there, talking about daylilies. Well, I was hooked. A friendship soon developed, and many purchases and participating in group orders along with BJ came in following years. About 8 years ago I co-founded the Westman Gardeners Club here in Brandon. We have approximately 50 members, hold monthly meetings with guest speakers and host an annual hort day in spring. I am presently the secretary, head of the program committee, and serve where ever needed for the club. In 1995 we moved to the acreage just north of Kemnay. Starting with landscaping a small flowerbed, on the south side of the house, the landscaping beds have grown to now encompass the original vegetable garden and 4 other large beds under and between trees. I am still working on placing walking paths throughout the original vegetable garden and moving the perennials out of the holding garden into their permanent spots. I am now also amending the soil, removing landscaping fabric (which I used to think was wonderful), removing invasive perennials, and re-mulching the beds which is turning out to be a very time consuming job. Over the years many have asked to buy this or that perennial and so I have sold the extra divisions as the various perennials have multiplied. What I can grow here on my acreage, anyone in a zone 2b or warmer garden should also be able to grow. 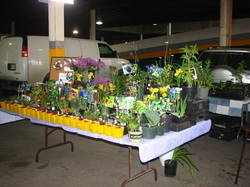 Purchasing and trading plants all across Canada is a lot of fun! Group orders to Italy for irises and the US for irises and peonies have made the purchase of the new perennials very affordable. Also, the trades of hostas, iris and other perennials to friends in British Columbia, Alberta, and other provinces keep the cost of each new perennial down too, as each of us simply pay for shipping of the plants we send. I love attending and being a member of the daylily club in Bismarck, North Dakota and have made a number of gardening friends there. I am also a member of various internet garden forums and email gardening groups as well as the Manitoba Regional Lily Society and the CanWest Iris Society. In July of 2010 I was a guest speaker at the Lily Festival in Neepawa with a power point presentation on "Perennial Companions of Lilies". Attending the American Iris Society convention in Victoria, BC in early June 2011 was a highlight of that summer. Regional and National conventions of the AHS (American Hemerocallis Society) are wonderful conventions to attend in mid summer. Minneapolis hosted the 2011 Regional in 2011 and the National in 2013. Meeting old and making new friends while looking at daylily gardens is great!! I also paint and teach classes in painting on plexiglass that look like stained glass projects. I have traveled as far as Winnipeg and Bismarck to do so. These projects are placed outside, year round in the flowerbeds. Hybridizing of daylilies and irises is so much fun! My first seedlings bloomed last summer and I am quite excited to see what they will look like this summer. Heuchera and miniature hosta beepods are gathered in fall and now those seedlings are doing well too. As the perennials have multiplied and people started requesting plants that I can grow in my yard, I have begun to take divisions off various perennials and will sell perennials at my Brandon Farmer's Market table in June and July, will donate to the Westman Gardeners' plant sale in June, and also bring plants to various events where I am a guest speaker. I now have over 3000 different perennials in my yard. Since 2011 I have had the honor of being a director on the Manitoba Regional Lily Society board. We meet 4 times a year and plan various lily events and fall bulb sales around Manitoba. Public speaking at various garden clubs and events on "Companion Perennials of Lilies", "Heuchera", "Itoh Peonies", "Gardening in the Shade", "Irises", "Gardening on a Budget", "Spring Flowering Bulbs", and "Hosta" has taken me all over southern Manitoba as well as into Saskatchewan, Ontario and North Dakota. Feel free to contact me if your garden club or organization needs a speaker. I am excited to have this website where I can share my love of gardening and hope that you will enjoy the pictures and the info on this site too!